This is my entry for this week’s Lasang Pinoy Sundays, which features photos of Filipino foods or foods cooked up by Pinoys. This week’s theme is Sour. While some people shy away from strong tastes such as sour, we seem to be drawn to it. Why, even when something doesn’t seem quite good enough to eat, we fix it up by dousing it with something sour. The photo I am entering for this week’s theme is not super sour, it is actually more on the sweet side with just a touch of tang. 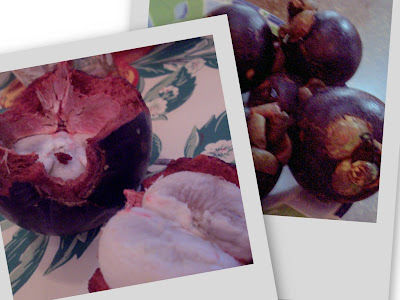 This is Mangosteen and we tasted it for the first time when we went to the Philippines a couple of years ago. We had almost drove by the fruit stand when the girls asked what the purple fruit was that was hanging in front of this store. So we made the driver turn around and we got a few to sample. As it was the last day before we were to fly home, we took these treats on the plane with us and ate them during the flight. What a delicious way to end a vacation! Check here for other LaPiS participants. My La.Pi.S entry is posted HERE. Me too to not having tasted the fruit but I’ve tried Magnolia’s Coffee Mangosteen ice cream and loved it. My friend Zara loves it, even buys the jam to pour over her ice cream.